The artist known as Prince has died … TMZ has learned. He was 57. Prince’s body was discovered at his Paisley Park compound in Minnesota early Thursday morning. The singer — full name Prince Rogers Nelson — had a medical emergency on April 15th that forced his private jet to make an emergency landing in Illinois. But he appeared at a concert the next day to assure his fans he was okay. His people told TMZ he was battling the flu. 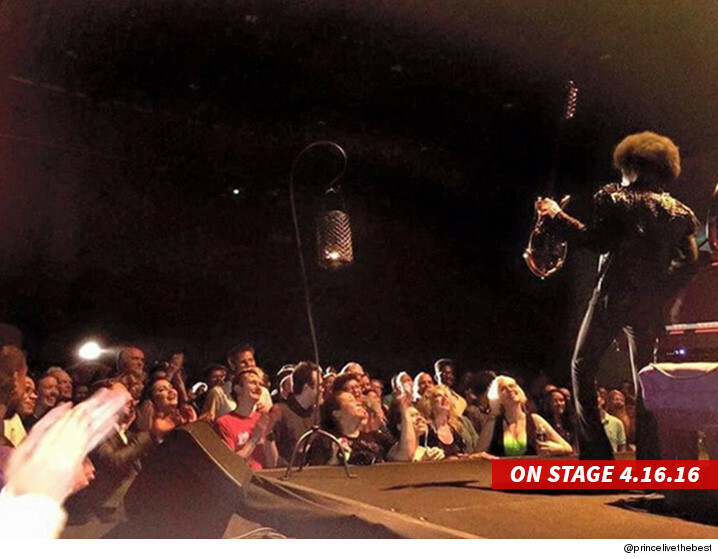 Prior to his most recent appearance however, Prince had cancelled two shows due to health concerns. He went on to churn out a ton of hits — and racking up 7 Grammys in the process. He also performed at the Super Bowl in 2007 … in one of the greatest live performances of all time. He also sold more than 100 million records during his career … and won the Academy Award for Best Original Song Score for Purple Rain in 1985. Prince was married two times — the first time to his backup dancer Mayte Garcia. They split in 2000. He then married Manuela Testolini … but they split in 2006. He was inducted into the Rock n Roll Hall of Fame in 2004, and performed a legendary version of “While My Guitar Gently Weeps” to close the ceremony.